We are now well into 2007 and we'd like to take this opportunity to wish everyone and especially Fiat 131 owners and enthusiasts a prosperous and successful year. We want 2007 to be known as "the year of the first 3ma" and with your help and of course attendance, we are sure we can achieve it. The 3ma organising team has been very busy looking into suitable accommodation, contacting the ferry companies to arrange discounts for sea crossings to Ireland and planning some spectacular drives to ensure maximum 131 enjoyment during the event. For ferry crossing options and accommodation details please look at the new trav & acc (travel and accommodation) section of the website. 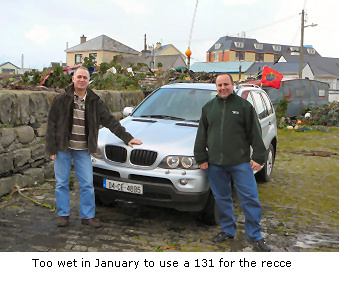 Theo Kyriacou and Simon Ryle, two of the 3ma organisers from the UK, travelled to Ireland for the weekend of 20-21 January where together with Kevin Doyle, the 3ma Team's Irish member, had a reconnaissance mission to try out the planned driving routes and finalise the accommodation options. 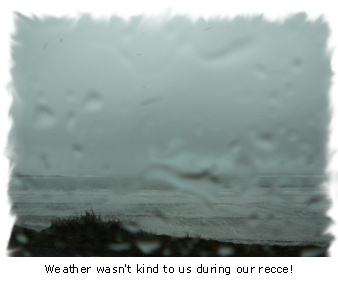 It was a successful recce mission even if the weather wasn't kind to us at all! We've seen all four seasons within a couple of minutes and the very changeable weather had sunshine, torrential rain, hail and even snow but was always very cold! But don't worry because we have chosen the dates for the 3ma very carefully. May is the driest month in Southwest Ireland so we are confident we'll have warm, sunny and dry weather for the 3ma! We've made some interesting observations during our recce mission in Ireland including the fact that we cannot rely on street and direction signs. It seems that if a sign can be turned on its pole, it's most likely that someone or something (wind?) has turned it! Once again, do not worry as detailed route instructions will soon be available for review and download on this website together with the detailed and finalised itinerary for the 3ma. 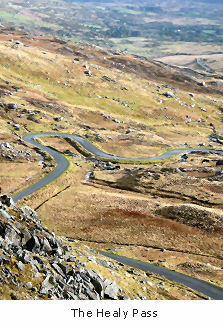 We believe we have come up with some superb driving routes with breathtaking scenery. We shall start our tour of Southwest Ireland from Dromoland Castle in County Clare and head for the Cliffs of Moher ("Cliffs of the ruin") which boast one of Ireland's most spectacular views. We'll then head South crossing the Shannon by ferry and ending day one at our chosen base for the weekend in Killarney. We have been researching local accommodation for a while and our team member in Ireland has visited several hotels in the Killarney area to find suitable accommodation for all of us as well as the cars. 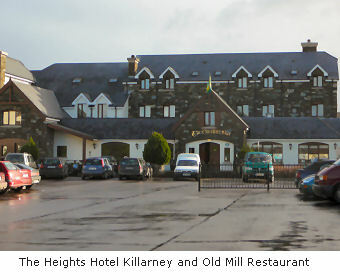 We have chosen the Heights Hotel which is one of Killarney's leading hotels, famed for its warm welcome and traditional Irish hospitality. We have negotiated a special rate of €55 (Euro) per person per night for dinner, bed and breakfast. The special rate rooms have to be booked with the hotel directly and are not available for booking online. Booking details can be found in the trav & acc (Travel and Accommodation) section of the website. From our chosen base for the extended weekend we will visit the Lakes of Killarney, drive the 170Km long Ring of Kerry and drive the Ring of Beara which includes the famous 13Km Healy Pass, a twisty mountain road from Adrigole Bridge in County Cork to Lauragh Bridge in County Kerry. The 3ma promises to be four days of pure 131 driving pleasure! Have a look at the Locations Gallery for some of the places and views you'll be able to see during the 3ma.